It’s just over a year since I wrote the first entry on this blog about my objective to run a sub three hour marathon. A year ago, I would never have dreamed that I would enjoy such a great running year, with the highlight being the amazing trip to Sierra Leone. Since my visit to Sierra Leone, the country has been ravaged by the outbreak of Ebola. It is heart breaking to read about the horrendous suffering and death that our brother and sister human beings are enduring. The charity that organised the marathon, StreetChild, has completely changed its focus and now concentrates solely on combatting Ebola, which is entirely understandable and laudable. There is little I can do except send some money, I applaud the brave medical professionals who have travelled to West Africa to fight this epidemic. Forget the footballers and actors and the vacuous wannabes on X-Factor and Strictly; those Doctors and Nurses are my greatest heroes. I am in awe of you all. It is difficult to write about something as trivial as running in the shadow of such a terrible thing as Ebola in West Africa, however, this is a running blog and running continues to be a major part of my life, so I’ll keep writing. Since May I’ve enjoyed an extended injury free period and I can say that 2014 has been the best year of my life in terms of running performance. I am starting to write the blog again in order to record my progress towards two races in 2015 – another crack at the Manchester Marathon in April and about six weeks afterwards, the Comrades Ultra Marathon in South Africa. For those that don’t know about Comrades, it’s a huge race with around 18,000 competitors, covering about 89 kilometres from Durban to Pietermaritzburg (alternate years run in the opposite direction. Durban to PM is dubbed an ‘up’ year and PM to Durban is a ‘down’ year because of the change in elevation between the start and finish). It has a strict 12 hour cut off – basically if you don’t make it within 12 hours you are persona non grata. Advice from friends and fellow runners is that you don’t really train specifically for an ultra, you do marathon training and make your longer runs a bit longer; maybe by doing one or two over marathon distance runs. Comrades is on May 31st 2015 – that’s 24 Weeks away. Like last year, I’ll get serious about training in the New Year – since the summer I have only been running about 30-40 miles per week, but with plenty of quality in there. I haven’t done any particularly long stuff. I have run a full cross country season for the first time ever. I know that cross country running is not my strong suit, so I raced it only rarely in the past. However, I have made more of an effort this year and I have really enjoyed the esprit de corps of being with my teammates at the races, cheering on the Ladies in their race and then going out and having my own little battle down the field. 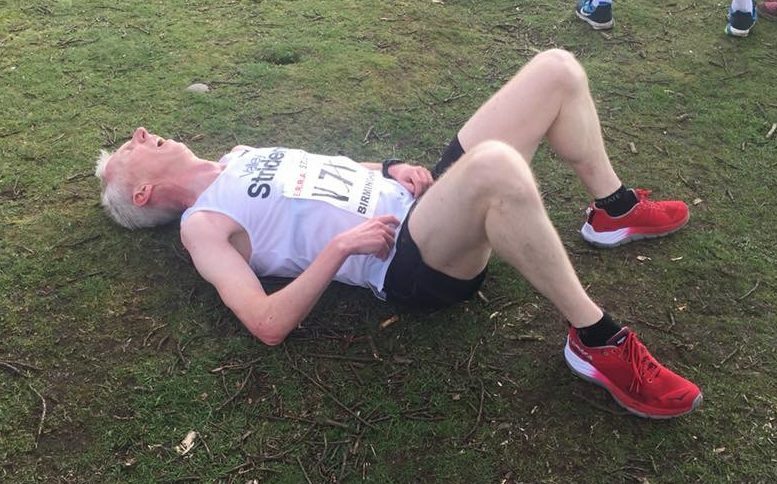 I haven’t managed to achieve a scoring position in the team yet (they go to the first 6 in the West Yorks League and the first 8 in the PECO league), but that’s no disgrace – my club Valley Striders is one of the strongest in Leeds in we have a roster of very talented runners, most younger than me. I said at the start of this post that I had enjoyed an extended injury free period. I have jinxed myself, because whilst this text has been sitting in draft, I’ve had two mishaps. I thought I was going well at the second Peco cross-country race last Sunday at Nostell Priory. I went out positively and picked off a few places during the heart of the race. As I entered the long finishing drag, Duncan Clark from Abbey Runners came past me. Right, I thought, I’ll have you in the finishing sprint and I put my head down to follow him, as I looked up a few metres on, I felt an almighty clunk as my cheek and neck struck a metal tree support. Basically I wasn’t looking where I was going and I ran into a fence. Idiot. I was a bit dazed for a few seconds and lost about 20 places as I staggered to the line. I was cut and bruised, but no lasting damage was done. Last night I joined the fast lads group for the Thursday night Valley Striders tempo run. This was advertised as 8 miles at 6.30 miling. I knew it would be a stretch for me to hang on, and I was completely blowing out of my backside as the first two miles were run in about 6 minutes 10 seconds each. More threshold than tempo for me. I clung on for another mile and then accepted that I was a goner, as I dropped away I felt my calf tweak. I have strained my calf a few times before and I knew that I would have to just jog back as best could the four miles in the cold and pouring rain. Thankfully, a couple of Striders, Gary and Rob ran back with me. I know that a strained calf probably means a minimum of two weeks off. The only consolation is that its not the worst time of year to get an injury like that. However, like most runners I get mightily grouchy when I can’t run.